The festival will be held in September at the Kentucky Exposition Center's Highland Festival Grounds. 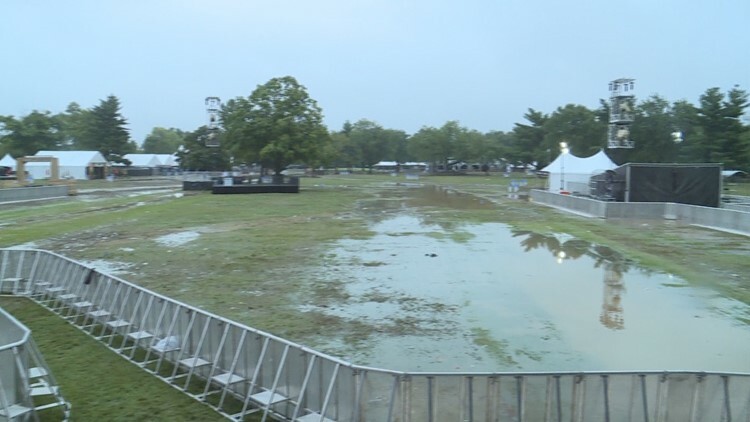 LOUISVILLE, Ky. (WHAS11) – A new music festival is headed to Louisville in September and at the same time, organizers are saying so long to a venue that brought big headaches. The announcement of that change has critics changing their tune. “It’s a victory, but it’s a victory for Louisville,” Tara Bassett said. Bassett frequents Champions Park and she’s happy about the new site at the Kentucky Expo Center. The Highlands Festival Grounds, getting away from the lowlands of Champions Park. “When they have had luck in having the concerts here during dry time, it has been luck,” Bassett said. Last year's muddy mess, a miserable memory for local photographer John Ohaver. "The truck tracks, the deep ruts and the amount of trash that was left behind,” he said. He captures the trail of trash, he says, still floating from the festival 5 months later. Festival leaders say they'll keep their promise and restore Champions Park but wet months haven't done much to speed things up. "We're working with the parks department to restore that property whether it ends up needing new sod, or dirt. We can't really access all the damage because a lot of it is underwater,” CEO Danny Hayes said. Bassett is putting her faith in Metro Councilman Bill Hollander. “He's working very hard to get this to the previous pristine condition it was in,” she said. Everyone seems hopeful that after last year's cancellation this change ensures the show will go on. Hayes said reports of toxic incinerator ash buried under parking spots had nothing to do with their plans to relocate. This is the first-ever festival that combines country music and bourbon. The lineup includes Luke Bryan, Tim McGraw, Keith Urban, and Little Big Town with additional appearances from Dwight Yoakam, Brett Young, Jake Owen, Bret Michaels, Frankie Ballard and more. The three stages will feature, in total, more than 30 artists. Tickets to this event will go on sale Friday, Feb. 15 at 2 p.m. Click here for more details. There will be bourbon tastings and workshops for those 21 and older. Bourbon from top distilleries will be featured, as well as vintage bourbons dating back as far as the 1930s. Hometown Rising said their official list of participating bourbon brands include Angel's Envy, Barrell Bourbon, Boone County, Cooper's Craft, Elijah Craig, Evan Williams, Jim Beam, Knob Creek, Larceny, Maker's Mark, Old Forester, Woodford Reserve, Four Roses Bourbon, and Kentucky Peerless. More announcements are expected to be made about participating bourbon brands. Danny Wimmer Presents is hosting two other events in Louisville, those will be happening after this event. Those events are Bourbon & Beyond (September 20-22) and Louder Than Life (September 27-29). Festival doors open at 11 a.m. daily.